Organizational Change Management can be a great way to increase employee engagement, improve performance and reduce your costs. However, many organizations struggle with implementing change successfully and seeing positive, measurable outcomes. In fact, research indicates that very few executives believe their organizational transformations were a success. A recent McKinsey Global Survey found that only 26 percent of executives said their transformations resulted in long term improvements in performance. Whether you’re looking to make the switch from an on premise solution, evaluate your software needs or expand upon current cloud applications, you can trust us to guide you through the software selection process and recommend the best possible solution for maximum results and long-term success. So, why don’t the majority of transformations stick? 1. Users don’t accept the change – Employees or customers can find workarounds if they don’t understand the reason for the change and will not adopt the new system. 2. Lack of reinforcement – If no one reinforces training, then people may abandon using the new system or you may lose employees and customers due to frustration over the change. 3. Lack of accountability – When no one is responsible for sustaining the transformation and measuring its impact or value, there is a significant chance that the program will not succeed long-term. If your organization has plans to undergo a major transformation – whether it’s a cloud ERP project, merger or acquisition, or another major IT initiative – how do you ensure it will stick? The long-term success of a business transformation initiative starts with planning and continues well after implementation. Based on our experience, realizing the full potential of your business transformation project requires building Organizational Change Management (OCM) into the project methodology and plan. Every successful project needs proper planning to ensure your transformation is set-up for success. We start every OCM initiative with a comprehensive OCM Assessment to review the current state of your technology, systems and processes. The next step is to determine a specialized plan needed to help you achieve the goals of your organization or department. • Identification of the level of change for each department and end user: Each department and their employees will see change in their own way. • Insights from front-line managers: Managers know their employees best and can provide valuable insights about what will work during OCM implementation. • Touchpoints for updates and communication: The bigger the change, the greater number of touch points that need to be incorporated into the OCM plan. • Comprehensive understanding of the corporate culture and employee demographics: If the OCM project spans multiple countries, cultural differences need to be taken into account. For example, employees in North Asia may be very process focused to ensure nothing is missed and will do what it takes to meet their manager’s request. In regions of North America, employees feel empowered to push back on timing. These differences will greatly influence the way implementation, training and reinforcement are managed in each region. Getting direct feedback from employees is essential. Consider conducting a survey, assigning a committee of employees or holding a few small focus groups to understand how employees work and get their input on the change. In other words, give them some ownership in the process. And, be certain to communicate with all employees impacted before implementation. Let them know what’s coming and how it will benefit or affect them. This will make the change less overwhelming and help you avoid potential misconceptions of what’s taking place. • Assign change ambassadors: The ambassadors will continue to champion the change and help with reinforcement. • Determine the methods that will be used to reinforce the change: Methods such as webinars, videos, in-person training, newsletter tips, etc. should be explored and considered based on the communication preferences of those impacted. • Pinpoint who will be responsible for measuring success: It is critical to identify who from the business units impacted will be accountable for measuring the success of the transformation and its ultimate impact on your organization. During implementation, a key focus of your OCM activities should be continuing to engage internal stakeholders. This can come in the form of a recognition program of super user groups or change ambassadors. Show them you value their hard work and appreciate their role in supporting the change and turning the project into a reality. Strategically rolling out communication throughout the implementation is key to keeping employees informed of the changes. Don’t forget to apply cultural considerations during this process – remembering how a message in one country or region could be interpreted differently in another. During this process, it is important to involve leadership and management so they understand how important it is for them to be engaged and even participate in meetings and training. At minimum, they need to be informed on what is happening and the impact the program will have on employees and customers. This will also help with team buy-in. • Make it interactive and avoid only doing traditional PowerPoint presentations or classroom training – think gaming, webinars and videos. • Use rewards or give prizes for moving through each phase or module of training. • Monitor engagement throughout the program to ensure team members are engaged, if they are getting it, etc. 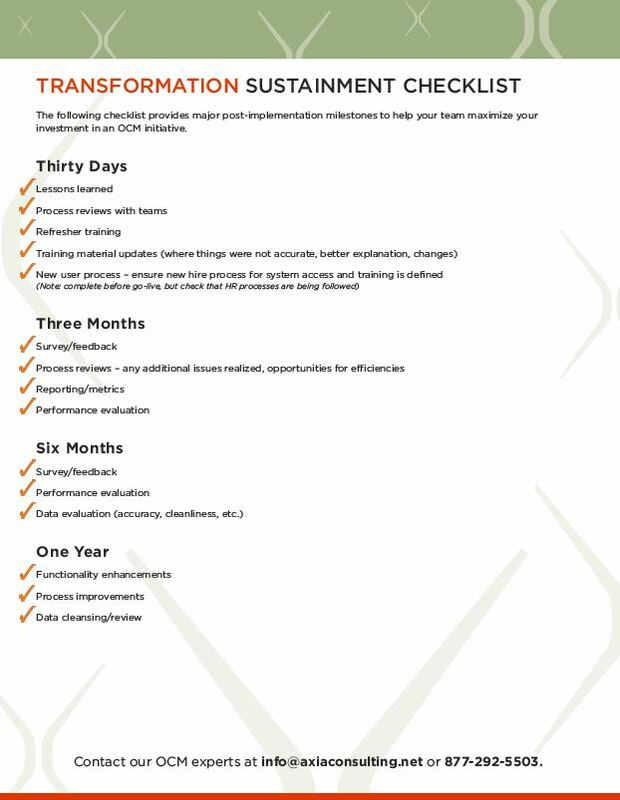 • Celebrate major training milestones as a company. One of the most critical aspect of training is to incorporate day-in-the-life scenarios into your timeline. Having employees walk through the actual future state scenarios at their desk instead of a structured classroom will help ensure they know how to apply the change to their work day. For example, before a go-live date on a large ERP implementation impacting customer service, go to their desks and have them walk you through their day. Have them check order status or do another daily job function to ensure they are comfortable. This will go a long way in impacting the long-term success of your transformation initiative. Now that you have planned your transition, it is time to learn how to make all your hard work stick. A successful OCM transition can provide long-term improvements for your organization. In our experience, lack of reinforcement after the go-live date is the primary reason why projects do not live up to their potential. Much of this comes down to accountability – meaning no one is responsible for reinforcement. As mentioned earlier, enlist members of your power user groups, leadership, supervisors and change ambassadors to help with change sustainment. Ultimately, the reinforcement should be led by a business unit champion versus IT, which has a primary focus of ensuring the technology is functioning properly. It’s crucial to continue training. People don’t typically retain every aspect of what they learn during a few training sessions held prior to a go-live date. It may take several reinforcement sessions to help them overcome what’s called the “Ebbinghaus Forgetting Curve.” This curve shows how individuals do not retain large portions of what they learn within hours. Focus on retention to improve transformation success. This can be done in the form of refresher sessions or by sharing helpful tips on a regular basis. Ask employees about areas they need help with and get input from supervisors on comprehension gaps. A strong reinforcement program is especially helpful to maximize the return of major IT initiatives. For example, when a new cloud-based system features new applications that your team has never used, show employees how a particular application will benefit the way they perform their daily tasks. Finally, don’t forget to share and celebrate key transformation milestones. For example, did your organization see an increase in productivity or fewer customer complaints after the change was implemented? Has the change been adopted by employees or customers? It’s important to communicate this data to leaders, IT, business units and the teams who have been involved in the transformation initiative. View our Transformation Sustainment Checklist to help your organization track critical milestones post implementation. At AXIA, we believe people are the key to a successful organizational transformation. We start by understanding your business goals, culture and the impact change will have on your employees. Our robust OCM assessment takes into account the complete lifecycle of the change initiative – from planning to long-term reinforcement. We partner with our clients through every step of implementation. Once we go-live on a project, our change sustainment experts are there to implement proactive strategies that result in long-term success. If you’re planning a major change initiative or recently completed one and need help with sustainment, tap into the expertise of our team. Contact our OCM experts at info@axiaconsulting.net or 877-292-5503. 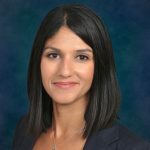 Bianka Shah leads AXIA’s Organizational Change Management Practice and is an experienced Change Leader dedicated to providing the right approach to managing and sustaining business and IT transformation programs for organizations. She has notable experience in Operations, Sales, Customer Service, Transportation and Leadership Development advising large clients in the Oil & Gas, Manufacturing, Packaging, Transportation, Financial and Insurance Industries. As an innovative problem solver, Bianka looks for challenges to assist organizations as they go through their change journey and determine the right approach based on the culture and landscape of the organization.